As one of the UK’s leading Sage Enterprise Management Business Partner’s Mysoft decided it was time to ‘practise what they preach’ and implement Sage EM for their own internal financial management. Previously using a less sophisticated Sage product and with rapid business growth over the last 5 years, they were finding that their business demands were outgrowing the capabilities of this solution. By implementing Sage EM they have already seen a return on investment in under 2 months. Finance Manager, Angela Swanepoel, tells us about her experience of implementing and using the new solution. Having only used the solution for 2 months, Angela is already finding it a lot more user intuitive than other finance solutions used previously, “I absolutely love Sage EM! It’s very user intuitive and by using mandatory information it makes the data entry very obvious. 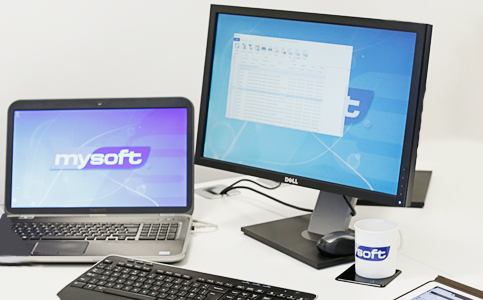 The possibilities are endless and I learn something new every day.” Managing all aspects of the finance department at Mysoft Angela is already seeing considerable advantages from using Sage EM, for example the ability to attach scanned documentation to records and automating business processes. Sage EM has taken considerable pressure off time consuming admin tasks, by automatically calculating multi-line journals and automating processes from other software products, e.g. Concur for expenses. It is in the details that Sage EM really starts to shine, by having Sales Orders and Purchase Orders linked Angela no longer needs to look in two different places, instead the solution reconciles for her at every stage of the transaction, saving considerable hours spent number crunching. "It used to take me about 3 days to process month end, but now, using Sage EM, I am able to do it in less than half a day!" "We have already seen an improvement in our cash-flow. This means that we are able to accommodate increasing volumes of new business more efficiently which will in turn enable the business to continue to grow." "It was a very well controlled, easy and smooth go live"